A new prince has been born to Duchess Kate Middleton and Prince William, and Jewish circumcision advocates are already trying to use this opportunity to seek celebrity endorsement for circumcision. "Duchess Kate Had a Boy, Call the Mohel"
The last time I checked, the Royals weren't Jewish. What does the Jewish Press care whether the new prince is circumcised or not? "Whether the royal baby is getting the royal snip is our new obsession"
"Sure we're curious about what the royal baby's name will be, but what we really want to know is: Will there be a royal mohel?" There doesn't seem to be a name attached to this article. I'd like to know who was the obsessed author of this piece. "Princess Diana apparently wasn't a fan, however, and her boys weren't given the snip (there were whispers that Prince Charles had both boys circumcised after Diana's death, but that remains unproven)." Very recently, Prince William was caught taking a wee, and there are pictures where it can clearly be seen that he has an anatomically correct organ. Those interested in taking a glance at the royal peen can visit this link. This "whisper" is nothing more than circumfetishist fantasy and Jewish wishful thinking. "Little prince in the U.K.: What about the bris?" Again, what in the world do Jews care whether the British goy prince is having a Jewish bris or not? Are they so desperate for validation of their blood ritual that they have to hope the new prince will be made into an unwitting poster boy? "One group that will not try to claim the prince for its own is the Jewish community." Will not? Or should not? Judging from other headlines, the above statement is but wishful thinking. "In a bizarre episode last month a former BBC reporter claimed that Kate, the royal mother, was of matrilineal Jewish descent, making the new prince also a member of the tribe... But serious Jewish genealogists were quick to quash the theory explaining that the Jewish-sounding names in Kate's lineage meant nothing and the prince would not be kosher." Thank goodness there are Jewish scholars with enough integrity to admit reality. Still, the author seems to be hopeful that Prince William was ultimately circumcised, going as far as MSN has, quoting "a multitude of sources," this time citing medical necessity instead of Charles rushing the children to be circumcised in Diana's untimely absence. "If a multitude of sources are to be trusted, then William was circumcised in a medical procedure (according to some versions of his own choice at a much later date) and Harry's foreskin is still intact." Indeed, who is this "multitude" being cited here as a trustworthy source? Much to the chagrin of hopeful Jews and circumfetishists, I'm afraid there is visual evidence that Prince William remains as his mother brought him to the world. Jews and other circumcision advocates want so badly for the new British heir to be ritually circumcised for their own vainglory. Let us hope Kate and William will have the good sense Princess Diana had and spare their child needless mutilation. "Bring me the royal baby and I’ll give him the snip, says top mohel"
"Prince George Being Circumcised? What Total TOSH!" Everyone wants to know whether the new prince will be genitally mutilated except the Brits. The views I express in this blog are my own individual opinion, and they do not necessarily reflect the views of all intactivists. I am but an individual with one opinion, and I do not pretend to speak for the intactivist movement as a whole. Circumcision vs. Foreskin: Which Is the Fetish? When the Queen is Dead: Long Live the Patriarchy? Thanks for writing this and pointing out the obvious "obsession" those who are cut have with making sure everyone else is minimized the same way they were. Seeing is believing. Thanks for the link to Williams willy. He even has the two finger gentle draw-back technique of an intact male. We have a perfect example of the obsession disguised behind conjecture that all mutilated males have in seeing the crime repeated, thus vindicating their own diminished condition. I'm concerned about the way you label this as all being about Jewish advocacy for circumcision and seem to be making this a Jewish story. Jewish publications are naturally interested in the story, but the articles and discussion online are not all from Jewish sources. It's a subject of interest to a lot of people because of the history of Royal circumcision and because it is still a common practice in America and elsewhere. Blaming the Jews for this story risks damaging the credibility of the Intact movement. Keep the criticism away from the Jews and stay focused on it in general. I am concerned about the way you are trying to make me out to look like I'm "criticizing the Jews." If you keep up with my blog, you will be aware that I will criticize all advocates of circumcision, Jewish or not, and I will not hold back from calling a spade a spade. 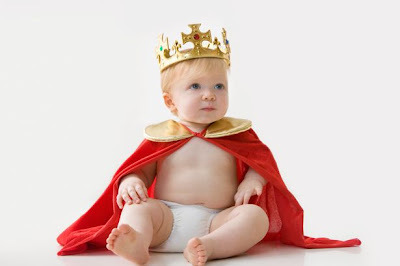 Yes, it is a fact that circumcision has a history in the British monarchy, and yes, perhaps it only follows that some will want to ask whether or not it will continue or stop with William. But I see a problem when a British prince is born, and the first thing Jewish publications are concerned about is whether or not the child will be circumcised, in the Jewish tradition of a bris conducted by a mohel no less. I see a problem, and I think it needs to be asked WHY. I'm not "blaming the Jews," obviously they're not the only ones talking about it. But why are the Jews who are talking about it wanting the royals to "call a mohel?" I'm going to ask, and I don't care if Jews invoke the anti-Semite card. That's getting too old and worn and has no effect on me. When it is warranted, no, I will not "keep the criticism away from the Jews." I will point and aim squarely. I will "keep the criticism away from the Jews" when they keep their mutilation away from the goyim. I am aware that not all Jews are pro-circumcision. Some of the most vocal activists in our movement happen to be Jews. I do not criticize all Jews, just the ones pushing to circumcise the whole world. Note: Added a disclaimer. Just as the Jews at the Jewish Press etc. don't speak for all Jews, I don't speak for all intactivists. I'm but one person with his own opinion and I aim to voice it. Shalom.